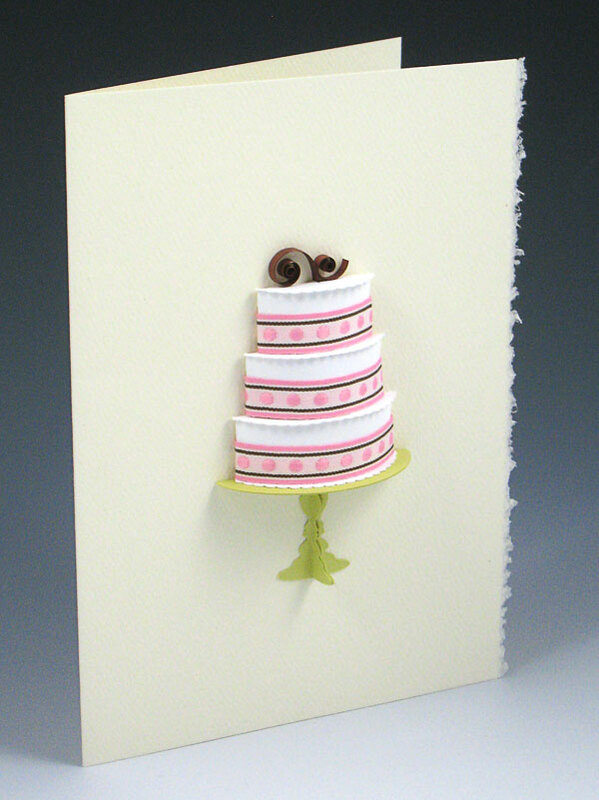 Here’s an idea I’ve been toying with – a paper 3D cake. I love the feel ribbon instantly gives to cakes. The chocolate shavings screamed to be made out of quilling strips. The platter/stand is cut from metallic green card stock. I even made a cake box to protect it, since it’ll get crushed in an envelope. Each tier is made separately in case they need to be varying paper stocks representing different flavors. This 3-tier cake is obviously for a wedding, but take away the top 2 and there’ll be more room for a message for birthdays or anniversaries. I hope you make this cake! It’s glorious. The stand is adorable.